The Society has a valuable library which is not only a good collection of books on archaeology and local history but is the only specialist lending library on these subjects in the county. Books, pamphlets and periodicals that can normally only be consulted in reference libraries can be borrowed by members. 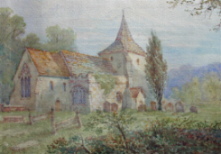 There is also a large archive of research material - paintings (left: watercolour of Mickleham church), prints, maps, photographs, press cuttings, card indexes, etc - which is available for study by prior arrangement at the Surrey History Centre. The Surrey Archaeological Society Library has now moved to our premises at Abinger and has re-opened on a limited basis there following several months of re-arrangement. The Society archives have been moved into secure storage at the Surrey History Centre. These can be consulted by contacting the Assistant Librarian who will check the availability of the items required.